Climate change is creating increasingly uncertain futures for people all over the globe. From melting ice caps, to rising sea levels, to wildfires and drought, every community is feeling the impact. We can react to disasters by providing aid and rebuilding, but how can we get out in front of them? Jacqueline McGlade has spent years studying climate change, worked with the United Nations Environment Programme, and is currently a Professor of Resilience and Sustainable Development at the University College London. She discusses how new technology and a growing understanding of the world’s ecosystems can help us adapt. She shares lessons she learned while studying the Inuit of Greenland and living with the Maasai in East Africa and explains how cultures focused on community can thrive in regions most-susceptible to climate change. McGlade argues there are at least seven principles, which if followed, can help build a resilient world. 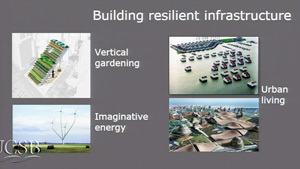 Watch (Re)active Resilience: How to Thrive in a Changing Climate.